Union Bank Of India or UBI is the India’s one of the largest government-owned banks.Union bank has almost all banking features to manage your bank account.You can apply for Union bank Internet banking service for fund transfer and online transactions.Unlike other banks, Union bank does not restrict to start Internet Banking Service process by visiting the nearest bank branch.You can start online net banking facility as soon as you have an account with Union Bank. Online self-user creation – Must have debit card: You require your debit card details to fill the form.This is most recommended for every Union bank account holders.It provides full features like fund transfer, bill payment, and other online transactions. Self User creation Without debit card – This is limited to view facility only.Therefore if you select this category you won’t be able to transfer fund. Well above procedure applied to retail customers.For corporate account user ID, you must contact you bank authority to granted special authorization. 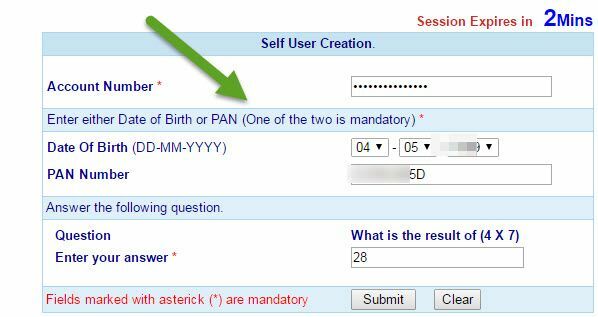 The next part directly lets you jump to the online form where you need to fill up details step by step.But before that you should know about some basic requirements for activating your internet banking service.This will help you to keep ready and avoid session timeout error.Check out the below 5 requirements for Self User Creation. Account Number – Enter your bank account number.You can find it from your bank passbook. After submitting successfully you will get another screen where you have to enter some more details for your netbanking facility.This time you need to submit debit card number (Enter 16 digits debit card numbers) and debit card pin.The PIN number contains 4 digits numeric code.Keep it confidential after using the code and don’t share with anyone. The next column requires transaction amount and transaction type.It basically one more secure step to verify the actual account holder.provide your recent transaction amount that you have spent or received.if you have spent choose the “Debit” otherwise choose “credit” option from the drop down menu. The next facility box is the most important step and lets you use internet banking service according to your choice.For the best experience, I recommend selecting “View & transaction” facility.Now check their policy box and click on submit button. As soon as you submit the page you will receive OTP to your registered mobile number.Enter the OTP code in the OTP verification box and wait for the next screen.The new screen displays the USER ID along with name.Note down the user ID in safe place, it requires to login to your account dashboard. Login password – It is your login password, each time you want to access netbanking dashboard you have to use login password. Transaction password – This is extra password layer for fund transfer.You can’t transfer funds without transaction password.This is required at the time of making payment or transferring fund to other third parties A/c holders. Tips: Set password between 8 characters to 14 characters.You can use the virtual keyboard from their secure page.Please don’t use very common word.Use alphanumeric combination with some special characters.It will secure your account from unwanted login attempt. Hope this tutorial helps you to activate your netbanking service with Union Bank.Still, if you need help you can contact me using the below comment form.